From marbled chocolate to dripping strawberry glaze, cheesecake is one of the most popular sweet treats in the United States. The typical cheesecake is made from soft, fresh cheese placed on top of a crust base. Some are baked, while others are not. A variety of toppings may enhance the appearance and flavor of the dessert, such as nuts, fruit and chocolate. Around the world, the dessert also appears in many different shapes, forms, and flavors. Before the Romans embraced the dessert after the conquest of Greece, the ancient Greeks were one of the first to popularize the cheesecake. Today, you will find Greek-style cheesecakes made with layers of buttered phyllo and a cheese-egg filling. A traditional, unpasteurized fresh cheese called mizithra plays a role in the fillings, which is comprised of milk and whey from sheep and/or goats. When the majority of modern cheesecakes made in the United States and Canada use cream cheese, Italians are known for using ricotta. The ancient Romans mixed flour, ricotta-like cheese, and honey to make their version of the cheesecake. It was then shaped into loaves. Today, the cheesecakes may include ricotta or mascarpone cheese, vanilla extract, and sugar. The ingredients typically produce a drier dessert than American versions. 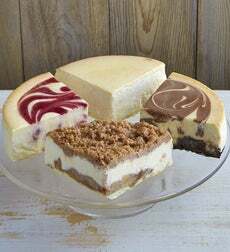 Decorating the menus of coffee shops and pubs, cheesecake in the United Kingdom is typically made with a mixture of cream cheese, sugar and cream as the filling. Crushed, buttered biscuits serve as the base, which is then topped with fruit compote, such as lemon curd, passionfruit, black current, and raspberry. 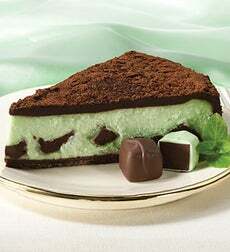 This type of cheesecake is also seen in Ireland, New Zealand, and Australia. A German-style cheesecake is baked using quark cheese made from sour milk, and often described as a “yogurt-like cheese.” The cheese creates a sweet yet unique taste. Using gelatin to bind the ingredients, a French-style cheesecake is very light in texture and flavor. The French use Neufchatel cheese – one of the oldest cheeses in France. The soft and slightly crumbly cheese offers a saltier and sharper taste. Often flavored with melted bittersweet chocolate, the crust of a Belgian cheesecake is made with speculaas – a traditional Dutch-Belgian biscuit. Fruit plays an important role in the cheesecakes of Latin America. In Brazil, a layer of guava marmalade (called goiabada) is added. The Argentineans serve their cheesecakes with strawberry or another berry marmalade as a topping. The powdered form of Japanese green tea called matcha is added as a flavoring for some of the cheesecakes in Japan. Other flavors include lychee and mango. The texture of the desserts is usually light and spongy. The flavor is also lighter and considerably less sweet than American cheesecakes.